Is Wellness Coaching the same as Health Coaching? What makes NSHC’s program different from all others? What is the cost of NSHC program? Why does NSHC program cost so much less than other health coaching certification programs? My organization has both clinicians and non-clinicians who want to take NSHC’s program. Is the study material different for these two groups? I don’t have a license as a clinician, how will NSHC’s Certificate of Completion benefit me? How long do I have to take the post test or certification exam and is there an additional testing fee? What is the difference in the online post test and the certification exam? How does the NSHC conduct testing? What does the Certification Exam consist of? What does the Skills Competency consist of? What if I fail the Certification Exam? What if I lose my earned certificates? What are NSHC Member Benefits? Does NSHC’s program contain motivational interviewing (MI)? What are some of the methods that organizations use to keep staff on track with NSHC’s self-study program? What is a NSHC CoachClinic®? If I attend a CoachClinic®, will I become a certified health coach at the end of the day? How do I schedule a CoachClinic® for my organization? How do I become a member of NSHC? The National Society of Health Coaches describes Evidence-Based Health Coaching (EBHC)® as the use of evidence-based skillfull conversation, clinical strategies and interventions to actively and safely engage clients in health behavior change to better self-manage their health, health risk, and acute and chronic conditions resulting in optimal wellness, lowered health risk, improved health outcomes and decreased health costs. Merriam-Webster defines wellness as the quality of state of being healthy; or in good health, especially as an activity- sought goal. The Centers for Disease Control define wellness as the degree to which one feels positive and enthusiastic about life. Therefore, it can be reasoned that wellness coaching is guidance and inspiration provided to otherwise "healthy" individuals who desire to maintain or improve their overall general health. In contrast, the premise of the NSHC is that health coaching is provided to those with disease, acute and chronic conditions, co-morbidities, and/or high health risks and shall be conducted by licensed/credentialed healthcare professionals who by virtue of their healthcare license/credential and clinical practice act may also provide clinical interventions and treatments within the coaching engagement and assume medico-liabilities for same. See NSHC's Position Statement located in the Quicks Links for additional details. Setting the gold standard for healthcare practitioners and clinicians in health coach certification, NSHC developed the Nation’s first Clinical Model of Evidence-based Health Coaching. Our program was developed by clinicians for clinicians and allied healthcare providers whose goal it is to implement evidence-based health coaching at the point of care to improve outcomes and reduce costs. The cost for program materials is $595. NSHC offers volume discount pricing for groups of 5 or more! Contact the NSHC via email: info@nshcoa.com or phone: 1 (888) 838-1260 for group pricing. Licensed and credentialed healthcare professionals have already spent thousands of dollars for a license/credential to practice clinically, and have the experience and expertise needed to successfully learn the new skills of health coaching and motivational interviewing without paying an enormous amount for it. No, the study materials are the same for both licensed and non-licensed individuals. The advantage of having the same program is that staffs are working from the same foundation and set of strategies; “working from the same page” so to speak, which enhances continuity of your services. 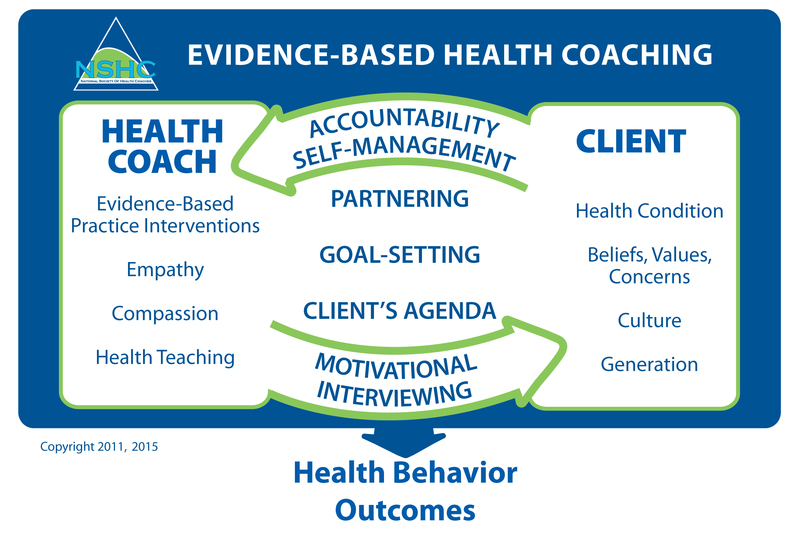 Evidence-based health coaching skills can benefit all individuals who work with people of all ages. Your organization will determine how your new health coaching skills will be used within your current position. We’ve had many people tell us that they have used the strategies with their families and children! Keep in mind that NHSC's program is designed for independent self-study, and that individuals taking our program vary widely in reading speeds, learning styles and comprehension. It is estimated that it takes a minimum of 85+ hours to complete NSHC's self-study. Testing is complimentary for 12-months from your date of purchase. If you purchased aspart of a group, the group's purchase date is the date used to calculate your complimentary 12-month period. If you choose to test the first time after the 12-month complimentary period, there is a testing fee of $50 and you must have a current NSHC Membership to access the Members Only online Testing Area. Membership renewal is $50. The online post test is for those individuals who are not licensed as healthcare practitioners. The online Certification Exam and Skills Competency is primarily for those individuals seeking health coach certification who have a license to provide medical advice and guidance. All testing is conducted online. The NSHC Testing Area is accessible 24/7 to those with current NSHC membership and current unencumbered professional license or credential. Complete details about testing are provided in NSHC's Members Only area of its website. Certification Examination is comprised of two parts. Part 1 Exam is Multiple Choice and Part 2 is Skills Competency. Part 1 contains 125 items and is timed. Part 1 must be passed before entry into Skills Competency is permitted. Skills competency is timed and is taken only after passing the multiple choice examination. It simulates health coaching encounters via online video, whereby your responses to the clients are graded. We provide one complimentary attempt. You may re-test in 30 days. Re-test Fee $50. If you re-test after your 12-month complimentary period, there is a re-test fee of $50 and membership renewal of $50. You must have a current NSHC Membership to access the Members Only Testing Area. Current NSHC members may log in to the website to view/print earned grades and certificates. Yes! We have an entire Section devoted to MI with a robust Training Video Series (produced by Psychotherapy.Net and Cathy Cole, MINT Trainer and former NSHC Professional Advisory Board Member). NSHC's highly popular Live Practice Webinars are also offered on a regular basis. Select an end date for all staff to have completed their study and testing. Meet with staff to determine what they believe to be a reasonable timeframe for their completion of study and testing. Give staff a paid day off periodically to meet together onsite for the purpose of independent study time. Give staff “assignments” of the various Manual Sections from week to week in order to meet a company or organization deadline. Each one reports progress to a designated leader. The NSHC's private onsite CoachClinic® is a daylong event provided specifically for an organization at their selected venue for its staff and invited guests. This highly interactive clinic is generally used to jumpstart the understanding and use of motivational interviewing within the patient/client engagement and the implementation of evidence-based health coaching by healthcare providers. The day is highlighted by guidance from the NSHC Lead Coaches in self-assessments, group discussion and hours of practice devoted to attendees developing their health coaching and motivational interviewing skills! No, it isn’t possible to cover all of the program materials in one day that are necessary in order to test. An onsite CoachClinic® gives you the advantage of having NSHC’s Lead Coaches guide you in live practice of evidence-based health coaching skills and strategies. Email us at: info@nshcoa.com to schedule a call to discuss details. General information can be found by clicking the CoachClinic® tab on the menu bar. Membership is exclusive and is automatic for those who purchase NSHC’s health coaching program. Your first year membership is free!